I tried taking piano lessons when I was a kid. I was never very good at it. I didn't practice as often as I should have and I had a hard time reading music and hitting the right keys at the same time. Today I can plunk out a tune on occasion. I prefer singing, which I think I do fairly well. No one sitting near me in church has said otherwise! My kids have a fabulous opportunity here for music instruction. Starting in the 3rd grade, students can take violin lessons after school. Henry has lessons twice a week in the music room at his own school. They are group lessons taught by 1-2 teachers from the local area. Since Frances has been in middle school she has been able to take lessons twice a week after school and once a week during school (in place of one of her electives on that day). They enjoy the music lessons and have made lots of practice since beginning. It's fun to listen to them talk about violin tablature, which is different from the sheet music I am used to. It's even better to listen to them play together. 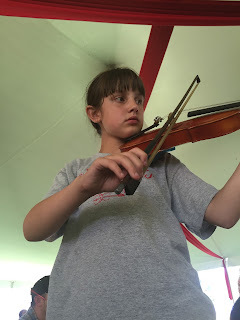 Last year, Frances had the opportunity to play at a music festival with a local band that had helped out with her violin camp. It was a lot of fun and Henry is excited to be involved this summer. Benjamin can't wait until he gets to third grade and he gets to start lessons!